Muhammad Nawaz Sharif, Friday said people had rejected the politics of disgracing others, so such politicians could not claim to be the leader of civilized Pakistanis. Without naming Pakistan Tehreek-e-Insaf’s chairman, he said the opposition was scared of the government’s journey of progress and prosperity and wanted to interrupt it at any cost. interest of common man,” he added. However, he categorically vowed not to bow down before opposition’s such attempts and negative propaganda. The Prime Minister said no previous governments, whether of General Musharraf or Pakistan Peoples Party, took steps for the development of country including construction of motorways or overcoming electricity shortage. He termed those responsible for energy crisis as ‘public offenders’ and said their apathy resulted in worse load-shedding of even 16 to 18 hours a day. The Prime Minister said the construction of a highway from Khunjrab having altitude of 16,000 feet at China border down to Gwadar was in progress, which would connect the country’s north with south. Prime Minister Nawaz Sharif said the ongoing journey towards progress was in fact pinching the opponents as it would earn the PML-N more opportunities to serve the masses leaving the adversaries just to wait. He advised the opposition not to impede national development rather support the government to get deliverance from power and gas crises, build motorways to bring in prosperity, end poverty and unemployment and inflation by enriching business activities. He said the inflation was on downward trend and an end to unemployment was among his top priorities. The prime minister reiterated that the government had broken the back of terrorists and highlighted his government’s welfare schemes like laptops and scholarships worth billions of rupees to students and free health treatment schemes for the poor. The free health treatment scheme would also be extended to Kahuta and Narh, he assured the audience chanting pro-PML-N and pro-Nawaz Sharif slogans. He said the government was overhauling the Railways into a self-sufficient entity, PIA was offering efficient services to passengers and Hajj pilgrims had been served with honour. Premier Sharif said the people had already rejected those impeding the government’s national development agenda. Highlighting his government’s transparent policies, the prime minister claimed that no one could blame the government for any kickback in projects’ execution during last three and half years. He announced various development projects for Kahuta and Kalar Sayedan including widening Rawalpindi-Kahuta road to two-lane highway, electrification and gas supply to all union councils of both the twons, upgradation of Kahuta hospital and 12 high schools to higher secondary schools. He also announced to fund the construction of roads with total stretch of 100 kilometers in Kahuta and Kalar Sayedan what he believed would bring in progress and prosperity in the area. He said a tunnel would be constructed through the hills falling on the way from Rawalpindi to Narh to reduce travel duration from three to one hour. The prime minister also tasked Raja Ashfaq Sarwar and Shahid Khaqan Abbasi to work out a roadmap to promote tourism in picturesque Kahuta area and committed to provide as much funds as required for the purpose. 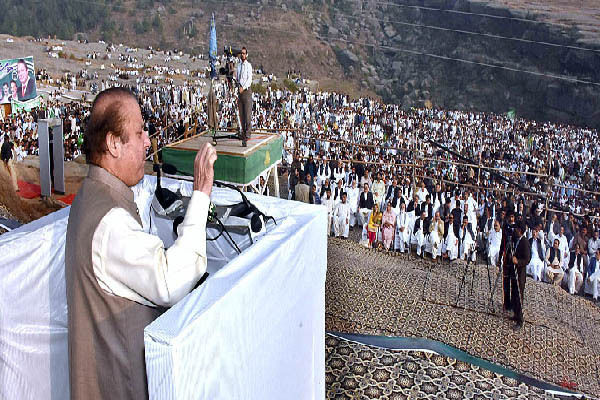 Chairman Pakistan Muslim League-N Raja Zafarul Haq addressing the gathering said the massive gathering in Kahuta’s far-flung Narh area reflected the love of local people for Prime Minister Nawaz Sharif. He said it was the public’s trust and confidence in Nawaz Sharif that made him a third-time prime minister. Minister for Petroleum and Natural Resources Shahid Khaqan in his speech said the tenure of PML-N government always proved to be an era of development and prosperity for masses, unlike his predecessors. He said the development work done by PML-N in three years was equivalent to 15 years of progress. Provincial minister Raja Ashfaq Sarwar highlighted the achievements of PML-N government including overcoming energy crisis, reduction in petroleum prices, and introduction of Kisaan package and Health Card for the common man. He mentioned that International Monetary Fund and World Bank had also acknowledged the government’s economic success.